Data from a ServiceMax object pre-populates a form in GoFormz. When the form is completed, GoFormz can: a) Update or create a ServiceMax object with data collected in the form, or b) Attach a PDF of the completed form to a ServiceMax object. The ServiceMax / GoFormz Integration uses the Workflow Rules native to the Force.com platform to send an Outbound Message to the GoFormz integration server. This architecture choice makes the integration very flexible. Workflow Rules can be triggered by any ServiceMax or Force.com object, and any field or combination of fields within that object. 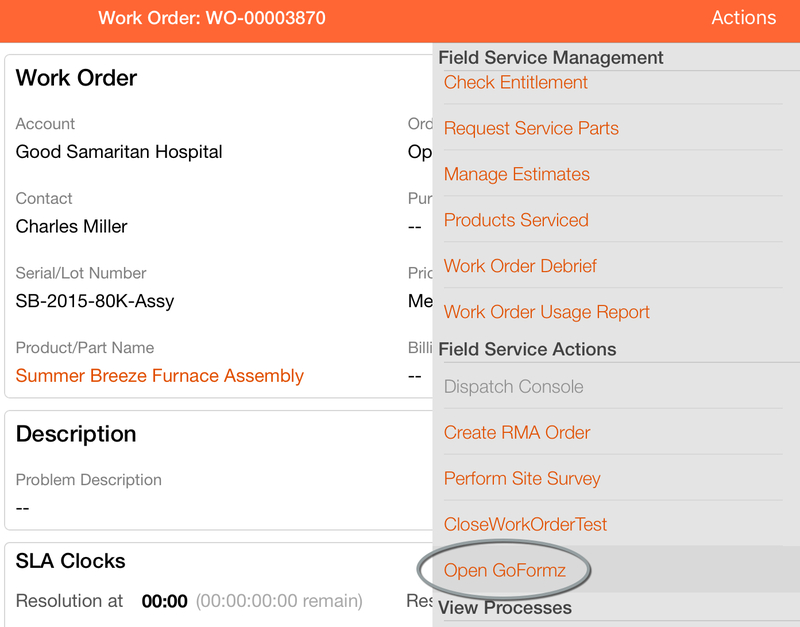 When the Create Form and Technician fields are filled on a Work Order, a form is created in that technician's GoFormz account, via the Workflow Rule method described above. When the technician completes the form, the data is sent back to the ServiceMax Work Order, along with a PDF of the completed form. As you go through this example, it is important to remember that this is just one use case. The integration is NOT specific to the Work Order object in ServiceMax. This integration works with any Force.com object, and any field within that object. 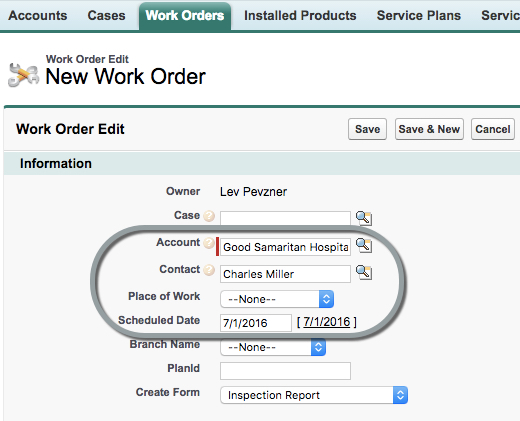 Navigate to the Work Orders tab in ServiceMax, and create a new work order. Then fill it out. In Step 2, we will see these values pre-filled in GoFormz. In the Create Form field, choose the desired GoFormz form. Note that the Create Form field is not necessary — you can set up a Workflow Rule using any field, as mentioned earlier. This is the field we are using for this example. In the Technician field, select the name of the technician dispatched to the job. The technician’s email address in ServiceMax must match their email address in GoFormz in order for the form to appear in that technician’s GoFormz account. Save the work order. As soon as you save, a new form is created in the technician’s GoFormz account. 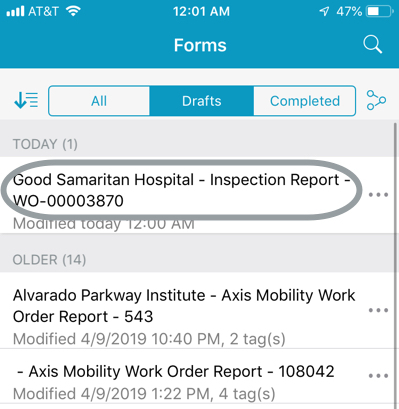 Log into the ServiceMax mobile app and find your Work Order. Tap Actions to open the Actions Menu, then tap the Open GoFormz link to launch the GoFormz app. There is a new form in your GoFormz account, corresponding to the work order. Open it. Note: Some fields are pre-filled from the ServiceMax Work Order. In this example, note the Technician Notes, Root Cause, and How Fixed entries. In Step 3, we will see this data transferred back to ServiceMax. Note: GoFormz offers a wide variety of field types that go well beyond text and number entry. For instance, the form can include an existing sketch, image, or diagram — or you can dynamically add a photo taken with your device’s camera. Both photos and sketches can be annotated, as shown in these examples. Note: GoFormz supports conditional logic. 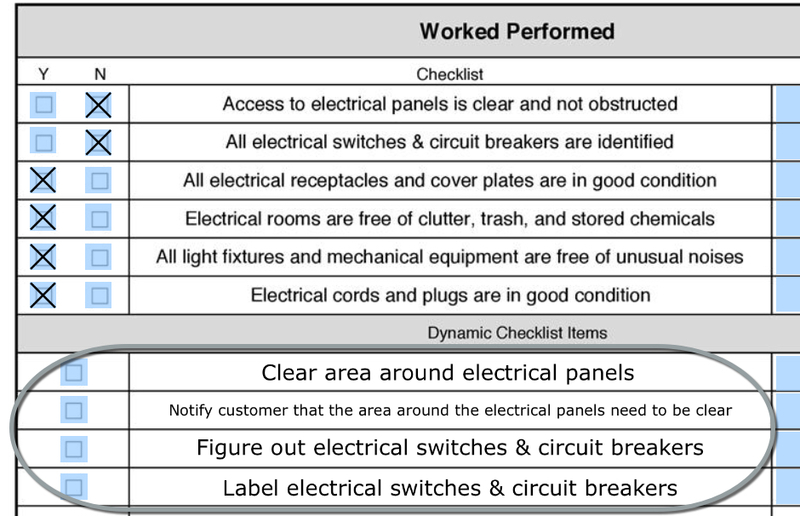 In this example, when you choose N in the main Checklist, a pair of associated items appear in the Dynamic Checklist. Note: GoFormz forms have calculated fields. In this example, they Y/N counts and the Result of Inspection at the bottom of the table are filled in automatically based on how which boxes are checked in the checklist. Note: GoFormz offers an alternative way to view the form, called the Field View. Many people find this to be a more convenient interface for filling out forms, especially on smartphones. Rest assured that data entered in the Field View is synced with data entered in the Form View, and vice versa. 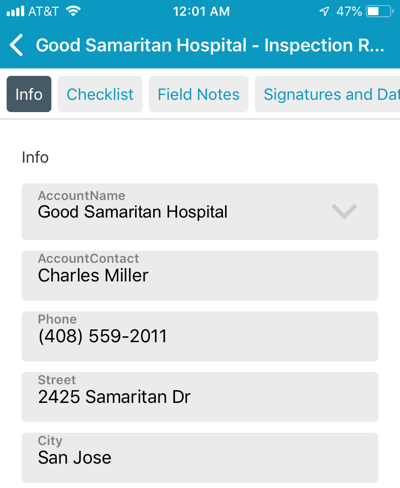 Tap the Complete button to complete the form and send the data back to ServiceMax. 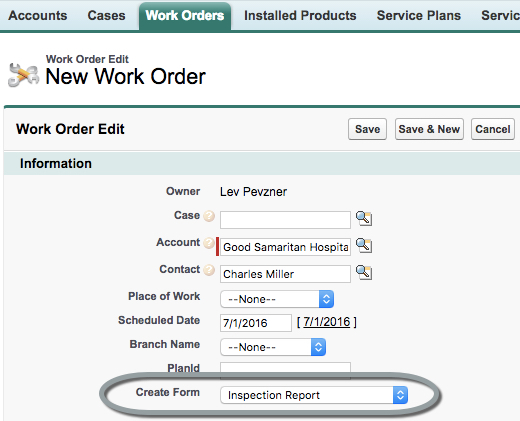 Navigate to the Work Orders tab in ServiceMax, and click on your Work Order to open it. Some additional fields are now filled in based on the technician’s entries in GoFormz. In this example, the Root Cause, How Fixed, and Technician Notes fields match what we entered in GoFormz in Step 2. This additional data can be very handy for compiling reports in ServiceMax. The Notes & Attachments section contains a PDF attachment with the completed form. Click View to see the PDF.